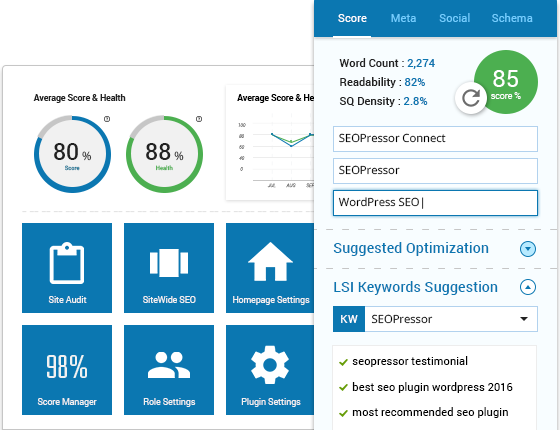 SEOPressor plugin gives you maximum SEO clarity on your WordPress sites with a host of customization & optimization features designed for controlling SEO with ease. 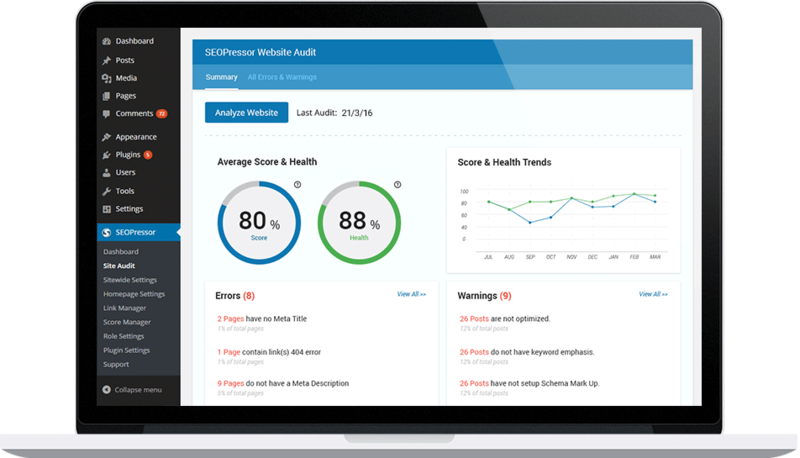 SEOPressor gathers the most essential SEO intelligence of your website and present them in one place. You can gain important insights to your website’s SEO health with crystal clear clarity. Powering more than 23 million WordPress pages worldwide, delivering tangible competitive edge to our trusted customers since our first iteration dating back to 2010. SEOPressor’s brand new 2016 algorithm is formulated based on semantic big data analysis of more than 3 billion rows of data.We are here to push you to the top of search ranking. A webpage with a focused theme tends to rank better on search engines. Amplify your content’s thematic signal for better search ranking by optimizing up to 3 keywords. SEO is messy and confusing, and most of us don’t even know where to start. SEOPressor solves this by providing you with systemized, prioritized and actionable suggestions so you know exactly what to do next. SEOPressor measures your website’s semantic quality with its built in semantic analytic called SemantiQ™ Engine. Through calculating and measuring your website’s data, it is able to suggest how to strengthen your contextual signal for precise search engine interpretation. Defining the markup of your website clearly will enable search engines to categorize your website accurately. With better categorization, your website will be able to achieve better search ranking in the age of Internet of Things (IoT). Maximum WordPress SEO control, for just $9 a month. Sounds Awesome? But We Are Just Getting Started. Subscribe and receive exclusive insider tips and tricks on SEO. Delivered to you right from the industry’s best SEO team. Copyright © 2019 SEOPressor. All Rights Reserved.